How to Install latest LAMP stack on Fedora 25 - DebYum. HomeLINUX/UNIXHow to Install latest LAMP stack on Fedora 25 – DebYum. LAMP stands for (Linux,Apache,Mysql/Mariadb,PHP). If you are planning to host your website (WordPress or any other PHP based CMS) then you should install LAMP or LEMP on your server. 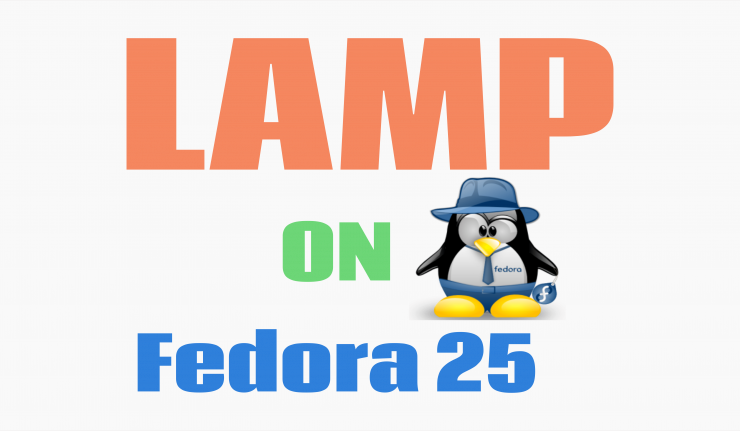 In this tutorial, we will install LAMP on Fedora 25 server. We will install latest versions of all the software’s included in LAMP stack. If you are planning to host your own website then you can buy a VPS from DigitalOcean. DigitalOcean is a simple and robust cloud computing platform best suited for hosting your own websites with complete control over your server. Use this link to sign up on Digital Ocean and you will get $10 credit to buy a VPS from DigitalOcean. For this tutorial, I have set up a Fedora 25 server on DigitalOcean. Hostname of Fedora 25 server. If you logged in as root then you should create a normal user. Make that user part of the Group “wheel” so that it can perform administrative tasks. Changing password for user engy. Switch to the recently created user to perform the rest of the tasks. Install and configure Firewall in Fedora 25. Start Firewalld at the boot time. Check the status of Firewalld service. Install LAMP on Fedora 25. 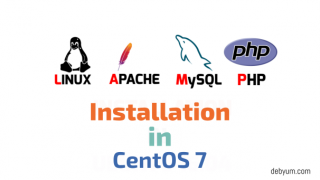 Now we will install the latest available version of Apache HTTP server, MySQL/MariaDB, and PHP. Install LAMP on Fedora 25: Apache 2.4.25. Apache HTTP Server 2.4.25 was Released on December 20, 2016. This version of Apache is latest GA release of the new generation 2.4.x branch of Apache HTTPD and represents fifteen years of innovation by the project, and is recommended over all previous releases. Install the latest version of Apache http server. 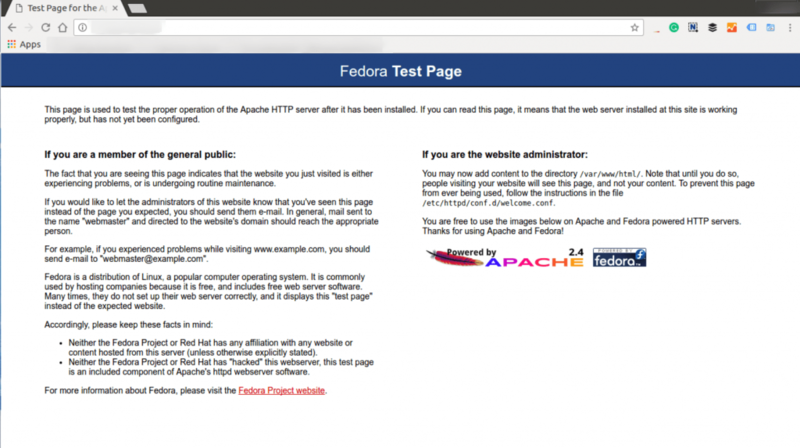 Fedora 25 already provides the latest version of Apache http server in its default repositories. So we don’t need to compile it from the source. Last metadata expiration check: 0:27:48 ago on Sun Jan 15 10:43:11 2017. Check the Version of Apache HTTP server. Make Apache server start at the boot time. Check the status of Apache Http server. Set the Directory index to serve Php files. Configure the Firewalld to allow http/https traffic. Verify the working of Apache server by visiting the ip address of your server in your browser. Install latest MariaDB server on Fedora 25. The latest version of MariaDB server available is 10.1.20. It is already provided by fedora 25 in its default repositories. Last metadata expiration check: 0:38:32 ago on Sun Jan 15 10:35:31 2017. Install the Latest version of MariaDB server. Check the version of Mariadb server. Start the MariaDB server now. Start the MariaDB server at the boot time now. 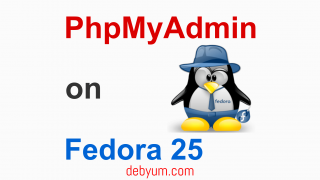 Install PHP in Fedora 25. PHP version 7 is available in Fedora 25. Last metadata expiration check: 0:59:52 ago on Sun Jan 15 10:35:31 2017. Install PHP and it’s important modules in Fedora 25.